What makes Humboldt County so good at song and dance? 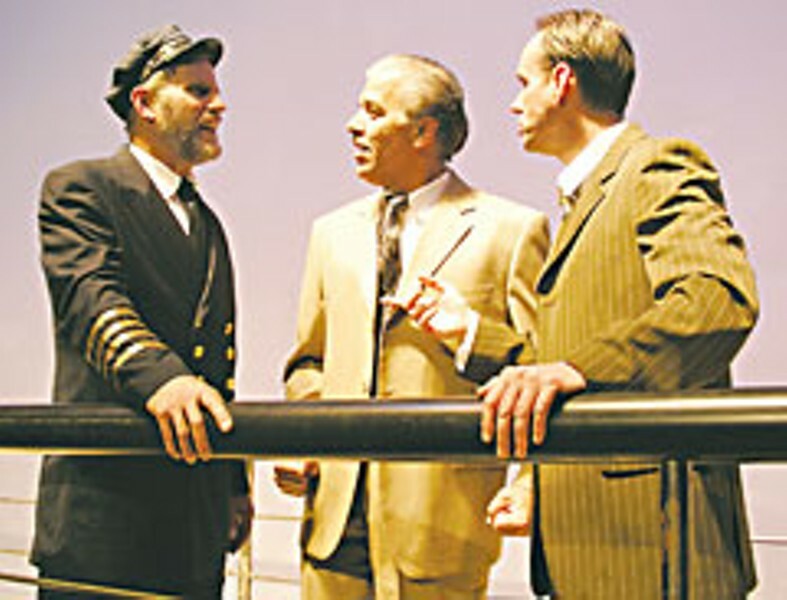 Scene from Humboldt Light Opera's production of Titanic. Photo courtesy of HLOC. The musical is not my favorite form of theatre. Yet when I look back on the past calendar year or more on the North Coast, many of the shows I've most admired have been musicals. This personal paradox came into view especially in the last month or so, when I saw four of them and had different responses to each. Two of these were imported shows — touring Broadway-based productions hosted by CenterArts. This is a unique species, and is a way of life for the actors and musicians involved. I've known a few and heard their stories. Someone here asked one of the participants in one of the touring shows where his home was. "On the bus," he said. They tour 10 months a year. The touring Evita and The Producers were both polished, professional shows with great sets, very good performers and production values. I hated Evita. I loved The Producers. And thereby hangs a tale. If you had to name crowd-pleasing forms, musicals would probably be at the top of the list, followed by physical theatre. But as it turns out, I am not a crowd. Nor am I a judge, making decisions on the basis of theatrical law and performance precedent. I am forced to confront these facts every time I write about a show, and most every time I see one. Tom Stoppard, who was a provincial theatre reviewer before he became an internationally acclaimed playwright, talks often in interviews about his own struggle with the reviewer's perspective. He started out trying to review objectively, according to standards. But he learned, especially from reading the contemporaneous reviews of Kenneth Tynan, that as a reviewer, "the only thing that mattered was the effect the play had on me personally that night. That was what I was reporting on ..."
I don't think it's the only thing that matters, but it is vital, and even more than that, it is unavoidable. We all bring different standards, experiences and tastes to each theatrical encounter. Even though I often include objective information about the audience as well as the play, I can't escape the sometimes inconvenient truth of being me. The idiosyncratic element is seldom clearer than when I see a musical. Take Evita. The production I saw at the Van Duzer was loud, flashy and, to me, empty. It was composed by Andrew Lloyd Webber, also responsible for the enormously popular Starlight Phantom Jesus Cats Superstar Opera Express. I went in knowing that I basically detest Andrew Lloyd Webber and his ilk, who dominated musicals from the '70s until recently with gaudy, bombastic, pretentious, meretricious, vacuous productions, and lousy music. That's the other thing — music is very important to me, and when I don't like it it's hard to even sit through a show. However, it is possible for a show to show me something else, to change my mind — to show me a good time. Evita didn't do that. It confirmed my worst preconceptions. But two weeks later, The Producers charmed me and made me giddy. It was funny, provocative and stylish, and the music, while not memorable, was fun. Part of this show's appeal is it's something of a throwback, with roots in classic Broadway and vaudeville, which its principal author, Mel Brooks, knows very well. But if the music is merely pleasant, and the rest of the show is entertaining, I can enjoy it. Such was the case with the Humboldt Light Opera's Titanic, which was my favorite homegrown musical production of the year. But when you add memorable songs — as in North Coast Rep's Fiddler on the Roof — you have the makings of a memorable evening. But I come back to my initial question — why did I like so many musicals done here recently? From one point of view, it would seem that community theaters with less than lavish resources should do smaller shows better, rather than elaborate musicals. But I think there are reasons, some more idiosyncratic than others. First, we've got a lot of musical talent and performing talent for the musical stage here, renewed by students coming to HSU. I was especially impressed that North Coast Rep could field 38 performers for Fiddler, while at the same time HSU had a cast of 30 for Urinetown. There's probably a general cultural bias at work for musical over dramatic talent (from TV and concert music, etc.) but there's also a local component. There's not a lot of great acting or actor training here, which professional theatre actors would define as finding the truth of a part or Laurence Olivier would describe as creating "goosebumps" in the audience by means of the actor's art. There's more training hereabouts for performance rather than acting, especially as derived from commedia and physical theatre, and audiences are more attuned to it. But there's something else that works for me. I despise the nauseatingly smooth and homogenized style of singing I hear on Broadway musical albums. I prefer the authentic voices I hear hereabouts. That goes for the staging as well — the lack of glitz and overkill at a typical North Coast Rep musical (even their Chicago was more modest than the movie or Broadway versions) or at Ferndale Rep (theirA Funny Thing Happened at the Forumbeing one of my favorites) focus attention on the essentials of the show: the performances, the music and the story. I like that. I offer these views partly as a past and future guide to my own inevitable prejudices. Also as some solace for the audience members I also think about — the ones who are trying to figure out why they aren't getting why everybody around them likes the show, or the reverse. Sometimes it's personal taste or experience, or lack of experience. And sometimes you aren't the only one seeing a naked emperor. Happy New Year. To extend the theatrical conversation and expand it beyondthe North Coast, visit the Stage Matters blog, atstagematters.blogspot.com.You can also e-mail me at stagematters@sbcglobal.net.